www.myfootballclub.co.uk - 'power of the tribes' in action! 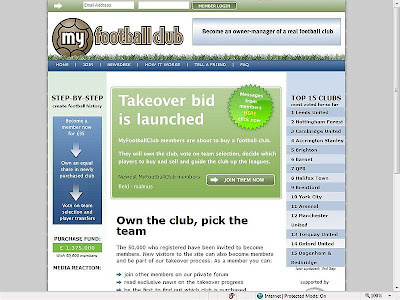 I was interested to see a story this week about http://www.myfootballclub.co.uk/ More than 53,000 people have registered at the site where for a £35 pledge they will form a consortium to take over a team. This is the latest example of how the internet is empowering consumers by enabling them to exercise power through co-operatives. These are disparate groups, but they are formed joined by a central theme. These people are defined by their common interest rather than traditional definitions of ‘ABC1 adults’, ‘ISBA London’, Std Reg Scotland etc, yet these social definitions still predominate. As technology allows consumers to act in different ways, and congregate from afar, systems that allow improved targeting will flourish. This is backed up by recent acquisitions (Google / Doubleclick, Microsoft / aQuantive) and recent developments like Panama. It also gives credence to the view that while the 80’s were all about creative and the 90’s all about media, then we are currently in the middle of a technology phase that shows no signs of slowing.